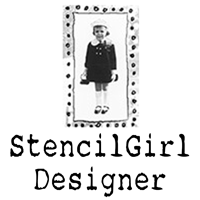 Next post: New Stencils at StencilGirl! 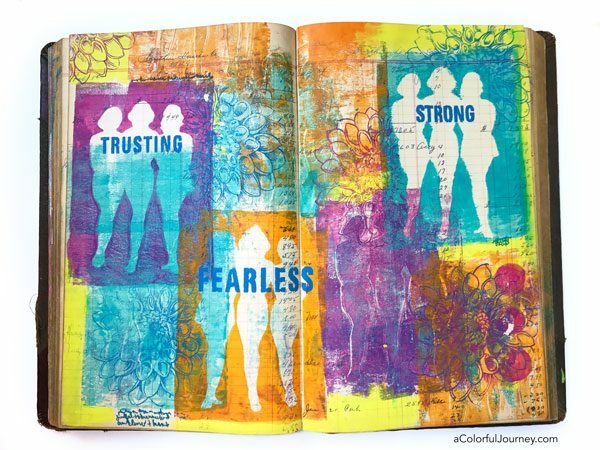 What’s a fast way to stencil when you’re working in a large art journal (or any thing else that is big)? 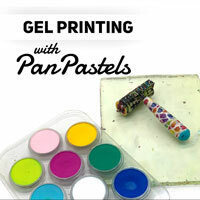 A gel plate! Not surprisingly, there was an O.O.P.S., an Outstanding Opportunity Presenting Suddenly while I played in this vintage journal. 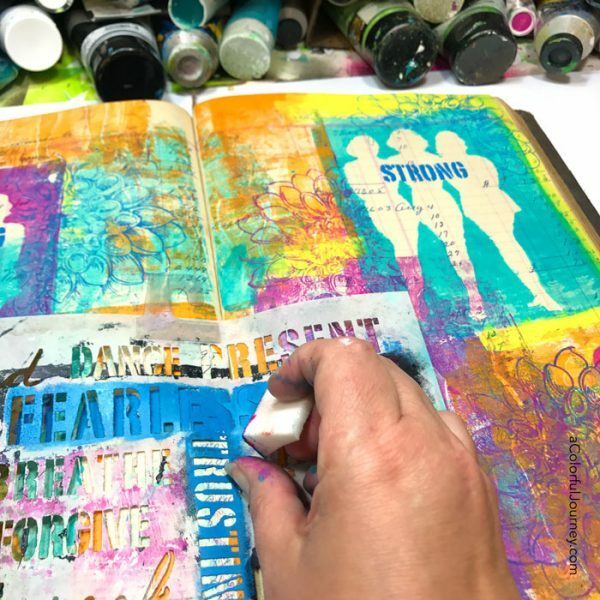 Watch Gel printing in a vintage ledger as an art journal on YouTube. 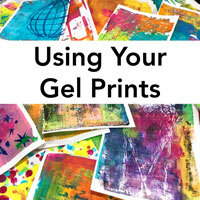 If you’re curious about gel printing, I have a page full of resources and videos here including getting started step-by-step, my husband making a print, tutorials and more. 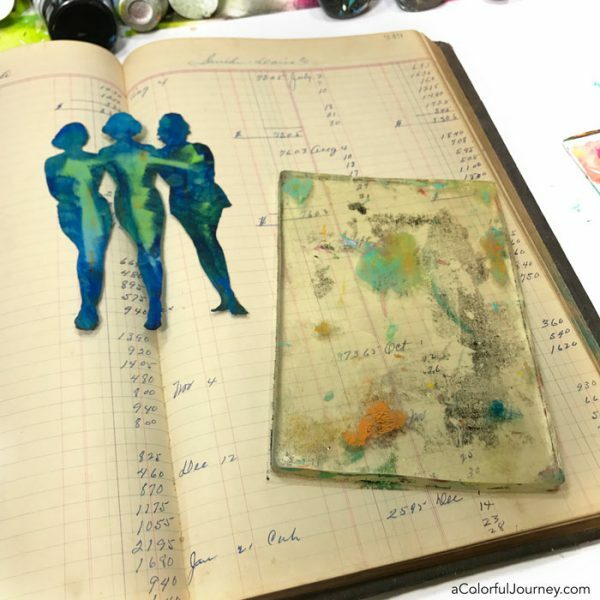 A 5 x 7 Gel Press plate and the mask from my Finding Your Tribe stencil/mask set built the first layer in this vintage ledger. 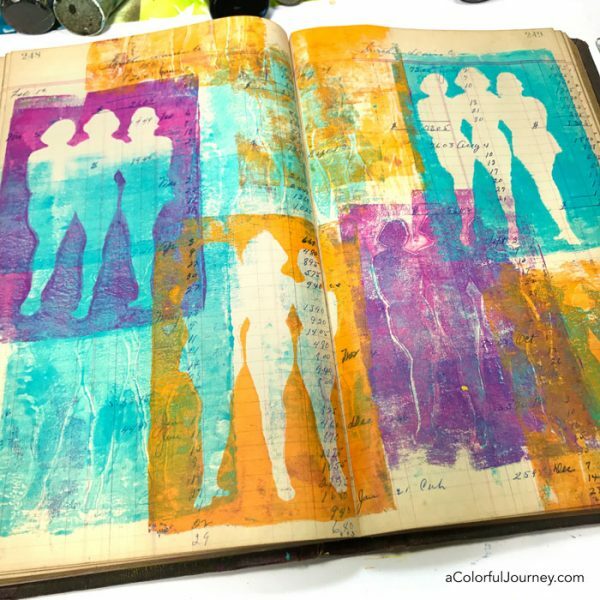 How did I turn it into an art journal? By arting on it. 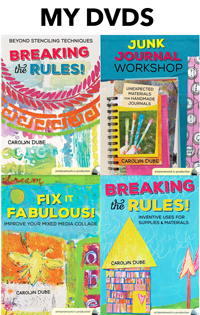 No prepping of the pages, just playing right on them. I put things on here willy nilly, grab and go, getting color and these 3 ladies all over the page. 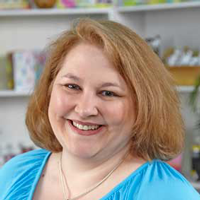 There was no plan that I knew of at this point but the muse had something up her sleeve. Of course, she wasn’t going to let me know what that was just yet. The gel plate acted as my ink pad to for the jumbo dahlia stamp. It looks like I stamped it behind the 3 women but you know that I stamped it after them so how did that happen? By putting the mask on top of the women before stamping, the flowers look like it they are behind them. 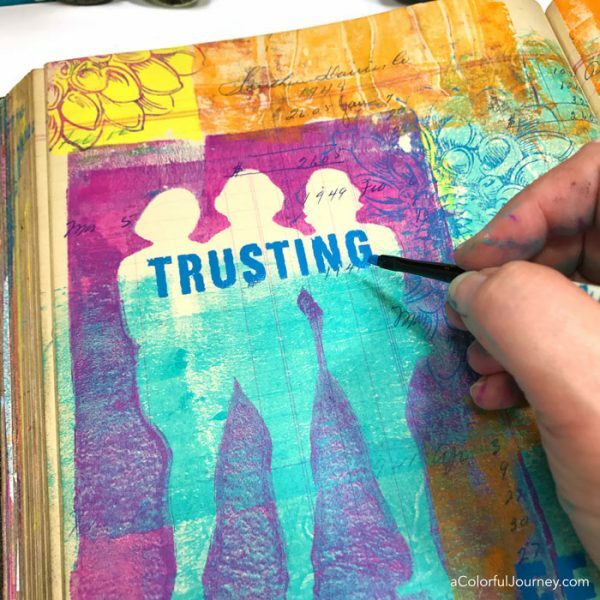 As I chose the words to use from my Uplifting Words stencil…the meaning became clear. An ode to friendship. I live far away from most of my arty creative friends, so I don’t get to see them in person nearly enough. But when I do get to spend time with them, it fills up my soul. This is almost like they stopped by for a visit in my art journal. Using a small paint brush, I painted over the stencil bridges. No one will know for sure if this was stamped, stenciled, or even hand lettered. Unless they know me, then they know for sure it wasn’t hand lettered. 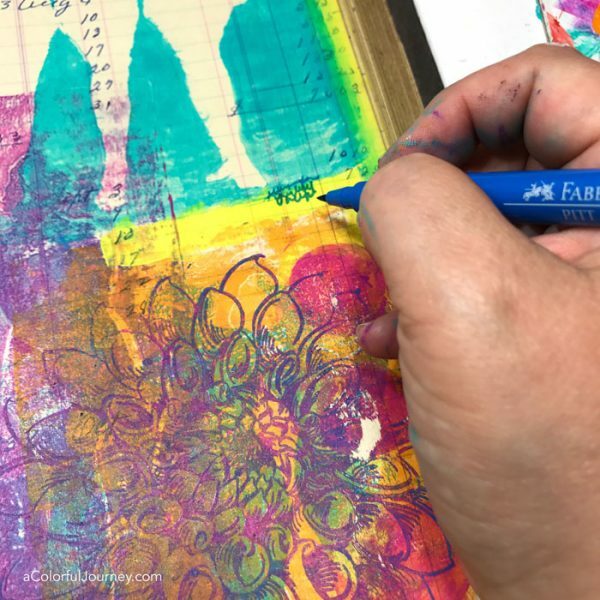 When journaling over paint, I highly recommend that the paint is completely dry or else it can be very tough on the pen. I try to follow that advice, but don’t always and the pens have paid the price for my impatientence. 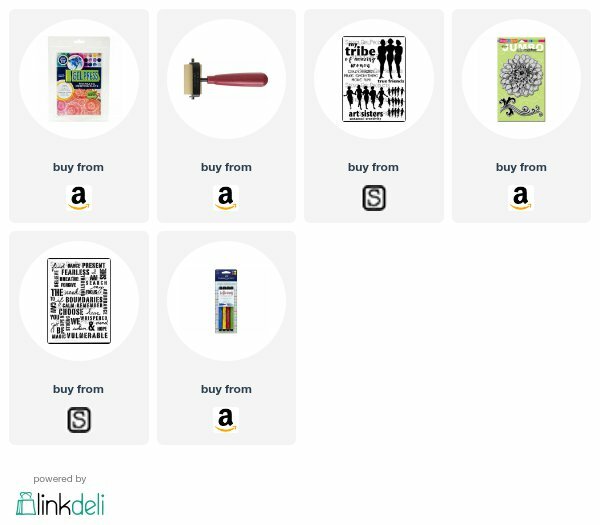 What did I write in my usual scribble writing? While reminiscing with my friends that stopped by, I captured some of our stories. Since some of the tales are rather embarrassing, it had to be illegible writing. After, all, I am in enough trouble with them after the comment about their age earlier in the video. 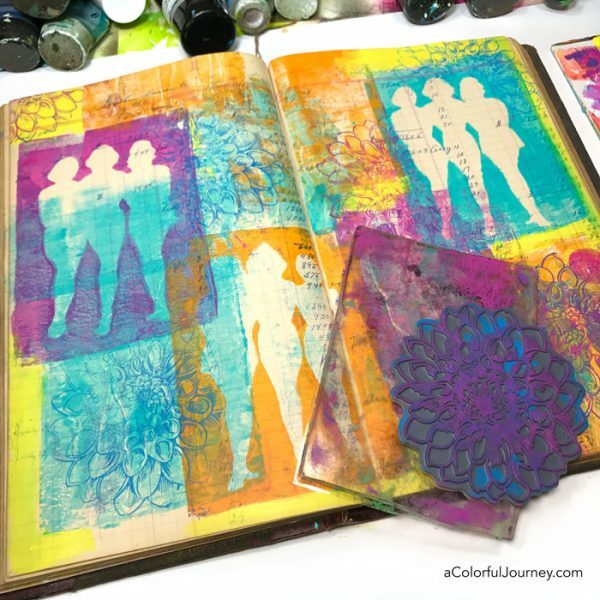 Thanks for stopping by for this art journal play! 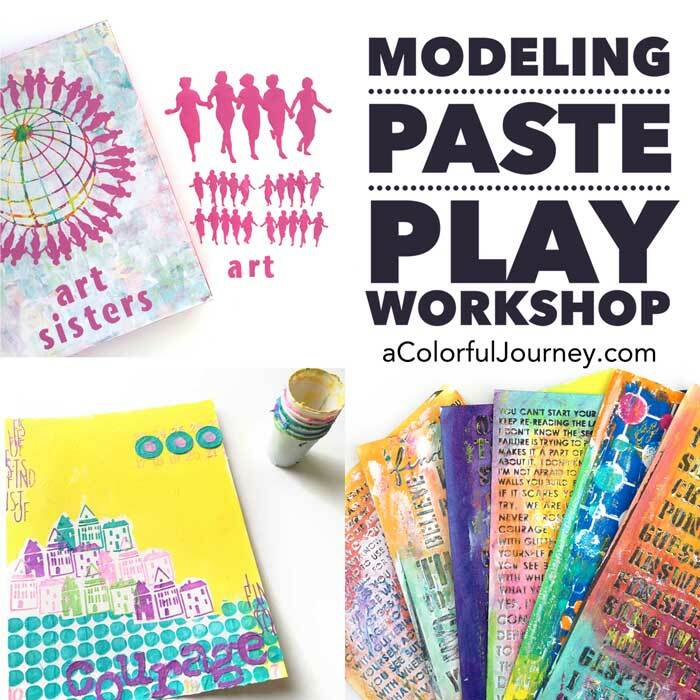 If you’re new to art journaling and ready to get started, check out my free workshop, Permission to Play! I enjoyed your homage to your longtime friends. That vintage ledger is so cool, and I love that huge dahlia stamp as background texture. What an amazing spread! Love the colors! And what a divine ledger!! Love the idea of using an old ledger. This page is fantastic and so personal. Great job!